This work is accompanied by a certificate of authenticity (no. 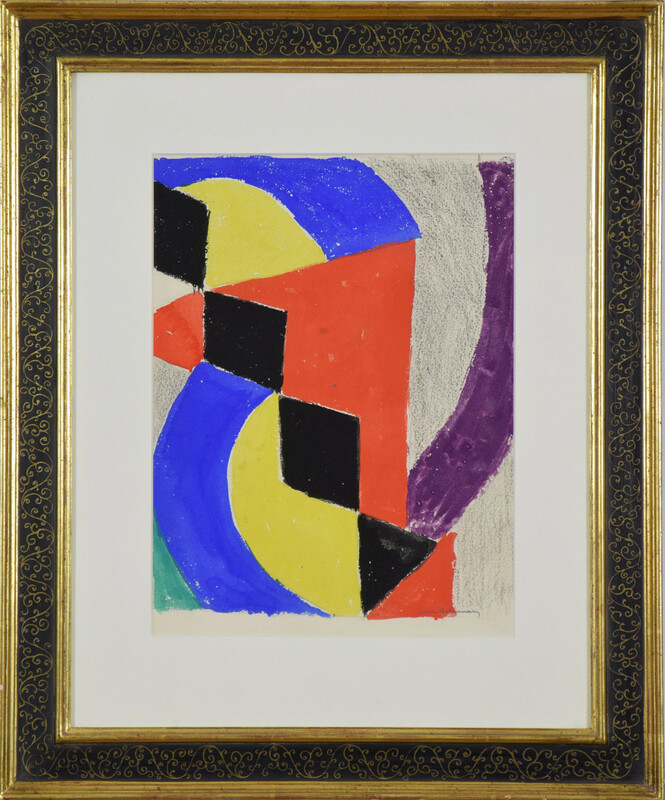 F1043) signed by Jean Louis Delaunay and Richard Riss and dated 7 January 2019. 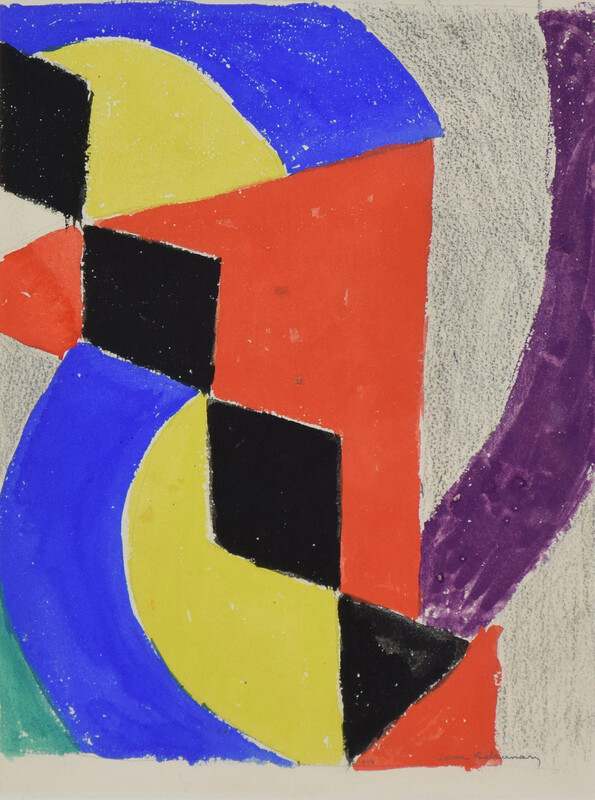 Sonia Delaunay’s art transcended the boundaries between fine and applied arts. Refusing to be categorised within the historically feminine notion of ‘craft’ art, Delaunay paved the way for many female artists. Apart from painting she experimented with tapestry, fashion, costumes for theatre and films and set design. Considered an integral part of the Parisian avant-garde in the early 20th century - alongside her husband the French painter Robert Delaunay - Delaunay developed the artistic movements Orphism and Simultanism. In 1960 Delaunay created a series of four works, including the present drawing, for the ‘Concorso Internazionale Menu per La Colomba’. This international painting competition was founded by Arturo Deana, a great patron of the arts and owner of the famous La Colomba restaurant, Venice. The restaurant was a known haunt for many artists, with the likes of Picasso, Chagall and Morandi often leaving behind works to pay for their bill. The first ‘Concorso Internazionale Menu per La Colomba’ took place in 1953, with the second edition of the prize being in 1960 with Twombly, De Chirico, Poliakoff, Alechinsky, Mathieu, Vedova and Fontana competing alongside Delaunay. Delaunay also created a tapestry after this work. 'Rythme Couleur, projet pour un menu 'Alla Colomba'' is characteristic of Delaunay’s later paintings which had greater formal freedom in their rhythmic patchwork of abstract, bright forms. The strong primary and secondary colours vibrate off each other giving the work an emotional vitality. Delaunay created a large series of ‘Rythme coloré’ throughout her career. These works stand as a testament to her continual experimentation into the language of colour and ‘pure’ painting. In 1959, the prior to the creation of this work, the Delaunays had their first retrospective in a French museum (Musée des Beaux-Arts, Lyon). This led to Sonia Delaunay receiving international recognition and she became the first living female artist to exhibit at the Louvre (1964). 114 works by herself and her husband were donated to the Musée National d’Art Moderne, Paris and she was awarded the French Legion of Honour (1975). Since her death in 1979, Sonia Delaunay has been the subject of major retrospectives around the world including Tate Modern in 2015, which was the first of its kind in the UK.